On game days, Bud Kerr could be found at Nat Bailey Stadium in Vancouver sitting in his usual spot — Section 7, Row 3, Seat 2. From his perch behind home plate, Mr. Kerr offered a running commentary on the game unfolding on the field. He was happiest telling a winding anecdote about some forgotten incident in the city’s rich lore of baseball history. 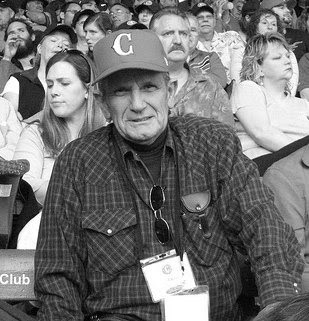 Baseball excited Mr. Kerr from his earliest memories as a juvenile ball hawk to his final years as an unpaid goodwill ambassador for the Vancouver Canadians. Mr. Kerr joined local baseball fans in recent years in saving the stadium from the wrecking ball. “The prettiest little ball park in baseball,” as it has been called, had fallen into disrepair and was threatened by a proposed curling facility to be built for the Olympics. Instead, the ball park was preserved. A wall of the new rink looms just beyond the right-field fence. Mr. Kerr’s informal reputation as a storyteller became official when the Canadians named him team historian. The club, purchased in 2007 by businessmen Jake Kerr (no relation) and Jeff Mooney, also decided to leave unsold two adjacent seats. Patrons were encouraged to join the historian for an inning or two of baseball chat. Some came to refer to him as Mr. Baseball, though Mr. Kerr correctly noted the title in Vancouver belonged without dispute to the late Bob Brown, a longtime club owner and manager. On his 72nd birthday, Mr. Kerr was informed by the club that a display inside the stadium was to carry his name. A year later, he was joined by former Montreal Expos star outfielder Tim Raines for the official unveiling of the Bud Kerr Museum. His introduction to the summer game came as a boy living uphill from the original Capilano Stadium, a wooden bandbox constructed by Mr. Brown at the corner of West Fifth Avenue and Hemlock Street. The park, which twice burned and was twice rebuilt, hung on the edge of an escarpment overlooking False Creek and Granville Island, surrounded by mills and other industrial enterprises. Neighbourhood boys gathered outside the park in hopes of catching a prized baseball struck foul. After the seventh inning stretch, young Bud and other kids would enter the grounds without having to pay admission. Catching a game’s final innings for free was a childhood delight. Later, he would be hired as a ball retriever, his duties including the pursuit of ball-scavenging urchins. He got a promotion and operated the scoreboard, hanging metal plates with numbers to indicate runs, hits, and errors. The owner, a notorious skinflint, paid him a princely 25 cents per game. On June 15, 1951, the teenager joined what at the time was the largest baseball audience in Vancouver history for the opening of new Capilano Stadium, a modern park built of concrete across from Queen Elizabeth Park. The infield grass of the old park, slated for demolition to make way for an on-ramp to the new Granville Street Bridge, was cut into strips and rolled before being moved for laying at the new venue. The park became home in 1956 to the Vancouver Mounties of the Pacific Coast League, a popular and competitive circuit seeking to rival the major leagues. (That dream ended when two major league franchises from New York, the Giants and the Dodgers, moved to California.) The Mounties represented a golden age of baseball as the likes of slick-fielding Brooks Robinson briefly patrolled third base before becoming a star with the Baltimore Orioles. The Mounties closed their doors after the 1969 season. The park was leased to arts groups and fell into disrepair until a new team, named the Canadians and owned by a brewery that coincidentally marketed a popular beer by that very name, joined the Pacific Coast League in 1978. The park was renamed for Nat Bailey, an owner of the Mounties, who died shortly before the start of the season. Mr. Kerr had been a regular at the park for much of its 58-year history. He rarely missed a Canadians game in recent years and could even be found in his seat for sparsely attended games in the chill of early spring featuring the University of British Columbia’s amateur team. Away from the park, Mr. Kerr worked as a furniture maker. He also moonlighted as a security guard at the horse track. He felt a lifelong cigarette habit combined with exposure to chemicals at his workplace was responsible for the chronic obstructive pulmonary disease with which he struggled over the final years of his life. He used a portable oxygen tank in recent years. After his death, a letter inviting him to a 1957 tryout with the Mounties was found among his papers. The information was news to some of his ballpark fans. A memorial service held at the park included the singing of “Take Me Out to the Ball Game.” Among the mourners was George Bowering, Canada’s first poet laureate. The Canadians have painted white Mr. Kerr’s seat in honour of the longtime fan. A moment of silence was held before the first pitch of the home opener, a tribute all the more poignant for bringing a temporary halt to the cheers, jeers and catcalls that so animate the park. James Robert (Bud) Kerr was born on July 9, 1935, at Vancouver. He died on May 9. He was 73. He leaves a daughter, a grandson, a brother, and a sister. He was predeceased by his wife.